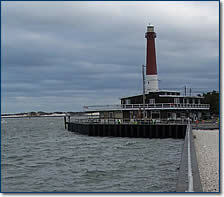 The Bureau of Coastal Engineering constructs and maintains shore protection structures including jetties, groins, seawalls, breakwaters, and bulkheads in order to protect the coastline and the navigable channels of New Jersey. Early shore protection measures included jetties and groins constructed perpendicular to the shoreline for the purpose of lessening the impacts of erosion by reducing the rate of sediment transport along vulnerable coastlines. A series of groins constructed along a shoreline, also referred to as "groin fields," serve to interrupt the ocean's near-shore littoral drift patterns and push the alongshore currents farther offshore. These structures stabilize areas along vulnerable coastlines, however can have unintended adverse impacts to down-drift beaches if alongshore sediments remain permanently impounded. Recent studies have indicated that increasing the permeability of new and existing groins can serve to provide both shoreline stabilization and limit diffusive losses when located within a large-scale beach nourishment project. New methods to increase groin permeability include lowering offshore crest elevations, notching and/or shortening of the groin, and increasing material porosity to allow a finite amount of sediment to pass over or through the groin. When incorporated with beach nourishment, permeable groins have proven to be effective in limiting overall project losses and subsequently extending the longevity of beachfills. In areas where the erosive forces exceed nature's ability to protect itself, seawalls, breakwaters and bulkheads can be a viable solution by providing both shoreline stabilization and coastal flood protection. When constructed along inlets, bays and other coastal waterways, these structures also serve to keep waterways clear of sediments and debris and maintain open navigation channels. Shore protection projects are funded through the Shore Protection Fund (N.J.S.A. 13:19-16 et seq), either through a federal-state-local cost share or a state-local cost share, depending on the size and scope of the project. Design and real estate acquisition costs are the responsibility of the local sponsor. 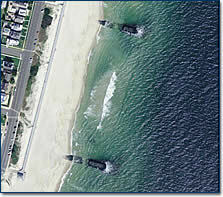 State-owned shore protection structures are designed, constructed and maintained through the Bureau of Coastal Engineering. 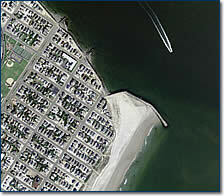 Additionally, the Bureau is currently conducting coastal flood control feasibility studies jointly with the U. S. Army Corps of Engineers along Raritan Bay, Delaware Bay, and Sandy Hook Bay, including the Shrewsbury and Navesink Rivers in Monmouth County for the purpose of storm damage reduction and ecosystem restoration.